Lots of Storage. Big pockets. Great material. Wonderful Bag. Best on Market. Best bowling bag that I have ever had! Easy to transport and many useful storage areas. Add also a extra attachment bag. Works well. hey all. I move 6 balls around nearly daily. I use this 4 baller and a 2 baller seperately. I am very comfortable with this bag, it has the right amount of pockets, quality of design and function. I mean it when I say it is the best 4 ball roller out there. What makes these unique is the way they stack. Many other 4 ballers use a shelf. that Shelf seems the same regardless of brand and it requires straps. These shelves are a HUGE design flaw. The feet indentation of the shelves don't fit the upper bag, the extra strapping is a pain, and generally it is sloppy. These other 4 ballers use a different handle that is much stronger AND LASTS. There is an inherent and not yet resolved problem with the Storm bags - the handles have a pin on the left and right side that seems to come out ON ALL models. I've checked with 3 pro - shops and all of them have had high returns from breakage. All the exact same problem as what happened to me, the pins came out the upper handle and troubles ensue. Now I saw one guy who recognized the pins were failing and actually screwed a large screw into the pins, thereby solving the problem. I didn't ask him if it stopped the unit from closing all the way. One of the best features of this bag is that when you lift off the upper bag, the handle collapses to 1/3 it's normal height! And, there is NO shelf on the storm units. The upper bag has molded feet so it SITS on the bottom bag. Smart. That makes it just small enough to fit in the back of my hyundai without having to lie it down. Perfect. All the others with shelves do NOT collapse quite as far and I cannot get them into the trunk without a lot of extra effort. The material is fine as expected, the shoe compartment holds my size 11's pretty well (it IS tight and I'd really like to see someone get size 15 W into it!) but the overall design is darn good, just wish the handle was better and stronger. Do you have an estimated availability? Hello Pam! 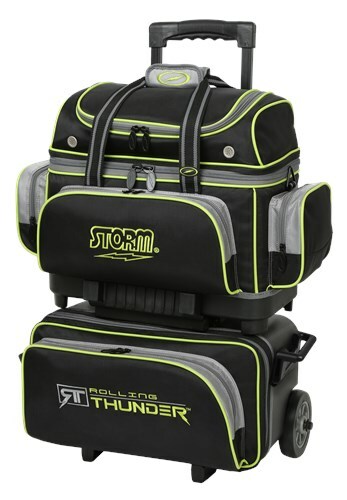 Storm has informed us that they have started receiving shipments of their new bags and they are sending them out to us as they receive them. They did not give an exact timeline, but they did say that all bags should be available by mid July. Does the top bag lock into place or is it strapped in? Hello! The top bag is connected by a strap with a clip on it. There are 3, 5 inch wheels for the Storm Rolling Thunder 4 Ball Roller. Hello Kathleen! Yes, the handle will retract flush with the top of the bag. The length of the handle will be 29 inches. I am looking to purchase the extra bag to extend from four balls to six. Do you have that portion available for sale? Unfortunately we do not. The 6 ball roller will have that middle compartment that you would need to make it into a 6 ball roller. 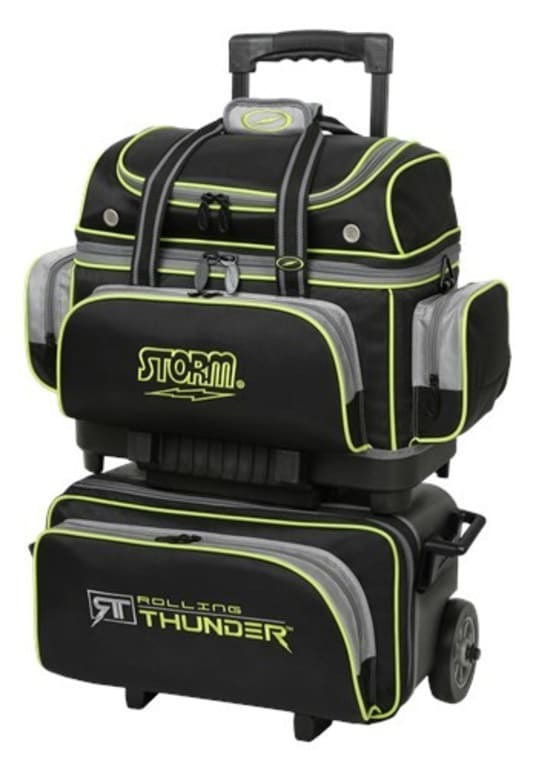 Due to the time it takes to produce the Storm Rolling Thunder 4 Ball Roller Black/Grey/Lime ball it will ship in immediately. We cannot ship this ball outside the United States.